During 2016 the energy field experienced reform, and this trend will most likely remain in 2017. Gas, electricity, heat energy, alternative energy, including renewable energy, housing and public utilities sectors as well as tariff formation all require sweeping reforms. The principles of market regulation are changing. It is vitally important to introduce reforms in full, as half measures may do great harm. Unfortunately, in practice the situation is different. On October 1, 2015, the Law of Ukraine On the Natural Gas Market came into force. It was to create competitive market and to give free access to the gas transmission network. In practice, the existing situation became even more complicated. The Law introduced the necessity to provide the network’s owner with a “guarantee fee” which, in fact, is a fee for access to the market. There is no talk about having access to the private consumers market. It remains monopolized by Naftogaz. There is a huge need to adopt laws related to electricity market regulation and tariff formation but they are continually postponed. The same situation can be seen in the energy saving and energy efficiency fields. In 2015 the regulation of Ethe SCO mechanism in the budget field was adopted. In 2016 it was discovered that the Law On Public Procurement did not cover the peculiarities of ESCO services procurement. Even after adopting the necessary amendments, it is still impossible to buy ESCO services as the ProZorro system cannot ensure this from the technical point of view. Another trend that occurred in 2016 was IFIs activation in energy efficiency projects. There is a growing demand for legal support on this market. In particular, Antika Law Firm advises on procurement procedures within the framework of modernization of educational buildings in Ivano-Frankivsk and Chernivtsi financed by NEFCO. The EBRD launched the IQ Energy project that consists of granting credits to condominiums and households to implement energy saving measures. At the same time, the need to finance this field considerably exceeds the level IFIs can offer. That is why an effective state program to attract private investments is vitally important. CMS Cameron McKenna is by far a top reputed market leading team with an impressive track record. The Kyiv-based energy, projects and construction practice group is a point of choice by major international upstream oil and gas companies operating in Ukraine. It is among main counsels working on energy disputes, handling several complex investment arbitrations. The team advised NAFTA a.s., a Slovak oil and gas exploration, production and gas storage company, in connection with the establishment of a joint venture with Cub Energy Inc., to pursue a gas exploration project in Western Ukraine. Renewable projects are another strong focus. For instance, the team advises Vestas on a number of wind power projects. The firm also works with EU energy traders on several major gas import and electricity export projects to/from Ukraine. Partners Olexander Martinenko and Vitaliy Radchenko are eminent figures on the market. Being a particularly vivid player in implementation of energy reforms, Baker McKenzie is traditionally chosen for complex landmark projects. Impressive client roster encompasses local and international names, inter alia, ArcelorMittal Kryvyi Rih, Cargill, DTEK Group. The office is regularly hired to handle corporate advisory, PPP, acquisitions in the sector, restructuring mandates. Baker McKenzie is known for continuously advising the EBRD on the corporate governance reform of the state company Naftogaz of Ukraine. Another highlight is legal support to prepare of Odesa Portside Plant for privatization. In 2016 the team was actively involved in nuclear power projects, advising on construction and operation of nuclear plants, and remains present in the renewable energy sector. The sizeable 8-lawyer team is led by two partners: Serhiy Piontkovsky, managing partner and head of the energy, mining and infrastructure and real estate and construction practice groups, and Ihor Olekhov, experienced in energy and renewable energy sources, PSAs, various aspects of banking and finance, transactions in the energy and resources area. The market also knows the name of Andrii Moskalyk (earlier worked at Clifford Chance) who joined as a senior associate. Highly-reputed national law firm Asters is known for advising prominent international majors and national players on production sharing agreements, investment agreements, high stake corporate matters and M&A, development, construction, financing, restructuring. This domestic energy practice has a wealth of expertise in electricity, renewable energy and energy efficiency. Asters advises Free Energy on supply of equipment for renewable energy projects; and OAK Utility Solutions & Development WLL on implementation of waste-to-energy projects in Ukraine. The lead partners of the practice team are Armen Khachaturyan (also regarded for extensive banking and corporate practices) and Tamara Lukanina. Counsel Yaroslav Petrov received praise for deep involvement in electricity, renewables, and recent work on energy efficiency projects. The latest development of the Ukrainian branch of Dentons includes established positions in the upstream oil and gas, nuclear and renewable energy (in particular solar and bioenergy). Its strong standing globally empowers the ability to gain mandates from high-profile companies, among others, Cub Energy Inc., Serinus Energy, Nitrofer SARL, OECD. Amongst notable landmark projects is advising Serinus Energy in connection with the sale of a 70% stake in KUB-Gas to Burisma, a private natural gas producer operating in Ukraine. The recent portfolio includes advising Swiss-based energy company Nitrofer on natural gas supply and trading. Myron Rabij, lead partner, works in the Kyiv and New York offices, possesses transactional experience and international industry knowledge. Partner Adam Mycyk deals with financial matters and M&A. Maksym Sysoiev is among the most vivid practitioners in the renewable field. Given the sharp industry approach, AEQUO’s practice is entrusted coverage throughout the oil and gas, conventional power and renewables sectors. The recent workload includes both transactional work and significant dispute track, especially international arbitration, sensitive competition issues, financial restructuring assignments. The firm acts as a Ukrainian law local counsel for a large European oil and gas company in international arbitration proceedings against a gas supplier with total amount of claims exceeding USD 65 billion. The firm also succeeds as a choice for inbound and outbound investments, and advised Guris Holding (Turkey) on a wind energy project in Odesa Region. The competition practice advised the client on the investigation initiated by the Antimonopoly Committee in relation to alleged abuse of dominance by Russian Gazprom in gas transit arrangements with Naftogaz/Ukrtransgaz. Two partners, Denis Lysenko and Anna Babych, manage projects for their energy clientele. The practice involves senior counsels team: Pavlo Byelousov is dedicated to high stake arbitration cases, and Sergey Denisenko is in charge of sophisticated antimonopoly matters across energy tiers. Myroslava Savchuk, senior associate, is an important team member. Arzinger deals with regulatory, transactional and contentious matters, year over year demonstrating broad industry coverage of its presence in the sector. The recent workflow includes energy efficiency and energy supply, structuring investments and joint activities, renewable advisory, litigation and arbitration cases. The firm acts as a legal counsel to the Ministry of Fuel and Energy of Ukraine, including issues of restructuring Naftogaz of Ukraine according to the requirements of the EU’s third package. The practice is led by managing partner Timur Bondaryev. Maryna Ilchuk, head of the energy and natural resources desk, is noted for regulatory advice; Markian Malskyy, partner and West Ukrainian branch head, is on the forefront of arbitration work; Andriy Selyutin, partner and head of the South branch is dedicated to oil and gas, international trade issues. The energy practice of Sayenko Kharenko utilizes expertise across different practice teams. In 2016 its broad remit covered regulatory, competition, international trade, taxation, debt restructuring and dispute resolution projects. The corporate and M&A practice is among its core strengths for industry specific instructions. The team led by partner Andrei Liakhov advised on the entry of the entire issued shares of Bluebird Merchant Ventures Ltd to the Standard Listing segment and to trading on the Main Market of the London Stock Exchange. He is especially active in acquisition projects in the mining field. The firm also traditionally acted as a Ukrainian law counsel to Nordic Environment Finance Corporation (NEFCO) as related to the project financing to over 20 Ukrainian enterprises and municipalities aimed at the implementation of energy-saving technologies. Other solid clients include DTEK, EBRD, Infracapital, mining, metal and oil and gas players. The firm’s partners are recognized for strong industry expertise: Vladimir Sayenko gets endorsement for transactional work and privatization experience; Nazar Chernyavsky — for project financing, energy saving and ESCO projects. Counsel Konstantin Gribov and managing associate Yuriy Draganchuk are the core members of the practice. Renowned ANTIKA’s energy practice is particularly noted for energy saving and efficiency, energy performance contracting, subsoil use and mining regulations, corporate and development projects. The firm advised International Resources Group during the Implementation of the USAID project “Municipal Energy Reform Project in Ukraine” in the city of Zaporizhia; and counseled NEFCO in the project Implementation Unit Support for Energy Efficiency improvements in public buildings in the cities of Chernivtsi and Ivano-Frankivsk. The client list is rich in significant names like Enesa a.s., Cadogan Petroleum, Chernomorneftegaz, Nadra Ukrayny, Ukrnafta and the EBRD. All partners of the firm are engaged in energy practice. Managing partner Alexey Kot handles current corporate work and arbitration cases being recently attracted as an expert/expert witness on matters of Ukrainian law. Alexander Burtovoy is known for his extensive project finance experience in energy efficiency and conservation projects; Andrey Kuznetsov runs litigation. In 2016 the firm raised activity in energy disputes, inter alia, debt recovery litigations and arbitrations. Counsel Sergii Korniienko (contract and corporate) was promoted to partner in 2017. EY has deep, and in some aspects unique, experience in oil and gas, being known for unmatched experience in tax and legal support of production sharing agreements and upstream projects based on a joint activity agreement in Ukraine for one of the largest international oil and gas companies. The team worked as legal and tax counsel with several large international and Russian oil and gas corporations. Albert Sych, partner, law leader for Ukraine, heads the practice. Iryna Kalyta and Iryna Kovalenko are important team members. The team of Redcliffe Partners is particularly known for its corporate, M&A and PSA projects in the oil and gas sector. It has retained a strong following from international players seeking advice in Ukraine, having among its clients Chevron Corporation, General Electric Company, Arawak Energy International Limited. The practice is led by Dmytro Fedoruk, partner and head of M&A, and supported by Zoryana Sozanska-Matviychuk, and Svitlana Teush. The firm commands a solid portfolio of finance and high profile restructuring projects. For example, guided by managing partner Olexiy Soshenko, the firm advised Landesbank Berlin AG on the restructuring of EUR 215 million indebtedness under project financing provided to Wind Power LLC, a Ukrainian operating asset of DTEK Renewables Group. Ukrainian firm EVERLEGAL has already received the appreciation of peers for stepping into an active energy market presence. Notably, the firm regularly advises clients on regulatory matters, cross-border commercial contracts, financing matters and handles M&A work. In 2016 the team substantially extended its renewable energy practice throughout involvement in M&A, joint venture establishments and financing matters relating to solar projects in Ukraine. The corporate practice is led by managing partner Yevheniy Deyneko, and partner Andriy Olenyuk extensively develops renewable energy matters. Ilyashev & Partners is well-known for its dispute resolution work handled for respected oil and gas, infrastructure clients. The firm has recently demonstrated an extensive portfolio in international arbitration, litigation, competition, bankruptcy and restructuring projects. The firm acts for Ostchem Holding (Group DF) in the case of recognizing in Ukraine the emergency award ruled by the Arbitration Institute by the Stockholm Chamber of Commerce in the USD 246.5 million suit against the Odesa Port Plant. On the competition front, the team represents Ukrtatnafta in the investigation by the Ukrainian competition authority. The client list includes UkrGaz, UkrGazEnergo, LetterOne Group, Black Iron Inc., Hydro Energy Holding, Group DF, Ostchem Holding, TBC Energy LLC, Zhigermunaiservice LLP (Kazakhstan). Milkhail Ilyashev is the lead partner. Significant team members include Oleg Trokhimchuk and Ivan Stasyuk. Wolf Theiss continues to register its presence in landmark transactions in Ukraine. The client roster of the outfit takes in AMIC Energy Management GmbH, Rubellius Capital, Kuwait Petroleum, Monstera Invest, Active Energy Plc. In the past year the firm advised AMIC on the acquisition of two Ukrainian companies that are engaged in the business of operation of refueling stations at Ukrainian airports. Taras Dumych, managing partner, is an experienced market resident, and is endorsed for transactional matters and gas transit knowledge. Vasil Kisil & Partners is seen advising energy assets transactions, survey, exploration and industrial development of mineral deposits, use of natural resources, project implementation under the framework of the Kyoto Protocol. Public clients of the firm include Shell, Hubei Changyang Hongxin Industrial Group Co., Ltd (China). Throughout the past year the firm advised on energy efficiency, electricity networks, renewable projects. Additionally, the litigation practice of the firm is constantly enlisted for various high value disputes. The team combines two practice groups led by two partners: Oleg Alyoshin heads oil and gas, and Alexander Borodkin, who heads renewable. The long-lasting market player Gramatskiy & Partners impresses with a supported track record of diverse commercial transactions, wide-ranging contractual issues, regulatory advice, corporate, restructuring and insolvency matters. The firm’s mainstay covers electricity production and distribution, energy efficiency, utilities, exploration and development, power plant construction. In addition, the firm maintains its dedication to public and municipal infrastructure projects. Among the recently completed projects was preparation of several exploitation and mining companies for merger; a number of projects concerning production and distribution of biofuel and energy saving technologies. Significant clients include SNT GROUP, Teploenergomontazh, Danfoss Ukraine, Eurotransgaz Corporation Kft, Eurogazinvest and others. Yuriy Zabiyaka oversees the practice. Given international energy companies and strong locals as clients (e.g., ENI SpA, Dragon Capital), DLA Piper in Ukraine possesses comprehensive advice on corporate, competition, regulatory, contractual, trading, licensing, and tax. In the outgoing year the office was busy with energy efficiency and corporate assignments, particularly acquisitions and JVs establishments. Currently, the team is advising GIZ, the German agency for international development and cooperation supporting the German government, on establishment of the Energy Efficiency Fund in Ukraine. Partners Oleksandr Kurdydyk has experience in energy trading, regulatory, oil and gas, power and renewables; while Galyna Zagorodniuk is mandated to advise on oil and gas regulation, M&A and JV mandates. In addition to its well-established position for corporate and banking/restructuring high value mandates, AVELLUM managed to expand litigation, arbitration and tax practices acting for solid industrial clientele. The firm acted as the Ukrainian legal counsel to a Chinese subsidiary of a Chinese state-owned Fortune Global 500 company in connection with the acquisition of majority stakes in Ukrainian SPVs owning solar power plants, generating electricity from alternative energy sources and selling it at a “green” tariff. Three partners works on the projects, namely Mykola Stetsenko (corporate and M&A), Glib Bondar (banking and finance), Dmytro Marchukov (dispute resolution). The energy practice of Eterna Law is one of its key practices. The firm renders advice in corporate, competition, tax, assets sale, wide range of regulatory matters, pricing, sanctions. Among notable ongoing projects is advising DonbassEnergo in the course of privatization of Сentroenergo, one of the leading power generating companies in Ukraine. The practice is supervised by corporate and M&A partner Oleh Malskyy, with involvement of two more partners, Maksym Uslystyi (head of Kazakhstan office) and Oksana Kneychuk (tax matters). KPMG Ukraine is traditionally present in regulatory and taxation, compliance matters. The legal team advised United Mining and Chemical Company on licensing and land law issues; gave legal expert witness services on Ukrainian legal matters to Ministry of Justice of Ukraine, e.g. oil and gas licensing, PPP, taxation of oil and gas production, in relation to UNCITRAL proceedings between foreign oil and gas as claimants and Ukraine as the respondent. Yuriy Katser, senior counsel, head of the legal department, leads energy projects. Lexwell & Partners has a solid track record of cases in the sector. The firm rendered legal support to ArcelorMittal Kryvyi Rih in a project on reconstruction of coke batteries, production and installation of equipment; and acted for ArcelorMittal Berislav PJSC in appealing against special permits for subsoil use. The firm stands out for being a legal counsel of Naftogaz of Ukraine in USD 500 million international arbitration regarding a corporate dispute with minority shareholder Ukrnafta PJSC. Andrey Kolupaev and Igor Nagai are primary contacts for energy matters. 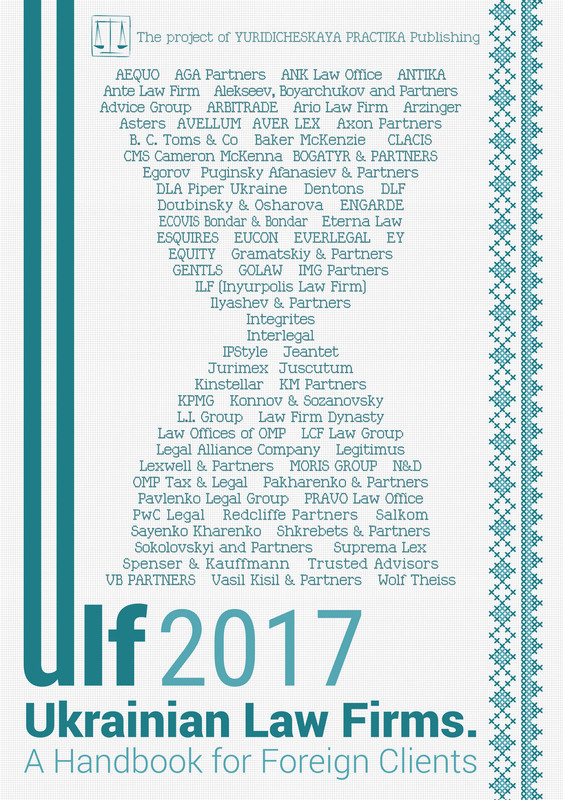 ILF (Inyurpolis Law Firm), a Ukrainian law firm with offices in Kharkiv and Kyiv, has deepened its focus in the energy efficiency field. The new offering of the firm is support for the energy service mechanism, known as ESCO projects, where the firm acted for Ukrainian Energy Trust, Energytehinvest, ESCO Energy Group and other clients. Other areas of expertise are PPP and renewable, equipment supply, corporate and taxation. The team was supervised by partner Serhiy Silchenko, with a particular contribution from associate Ivan Bondarchuk. Spenser & Kauffmann reaffirms its presence on the market with the rapid expansion of practice areas. Given an accumulated track record within different departments of the firm, a separate dedicated practice has been launched, contributing with the expertise in corporate and M&A, construction, project finance. Among the team’s recent performance are assignments in the renewable sector, including wind, solar and sustainable technologies. The practice is led by the firm’s counsel Vitaliya Karhova. EQUITY (called FCLEX up till June 2017), a domestic law firm, is mostly known for its strong dispute resolution capabilities, while recently it enhanced its portfolio with corporate and M&A, finance, projects development, administrative law and regulatory compliance. The firm is often contacted for ore mining enterprises, energy generating and distribution companies, investors of large infrastructure, energy and transportation sectors. It continues an ambitious project of exploration and development of the Belanovo field and construction of the Ferrexpo Belanovo Mining. Vyacheslav Krahlevych, partner, is the main contact. KM Partners is regularly enlisted for business projects connected with exploration and development of minerals deposits, use of natural resources. Standout expertise includes subsoil use, with the focus on tax aspects, specific regulatory compliance and environmental law, including disputes. Partners Alexander Minin, Maxim Oleksiyuk, Alexander Shemiatkin led project work. In 2016 LCF Law Group enriched its clientele with local and foreign energy companies, and reframed its litigation force with special practice focused on energy disputes. The firm represented Golden Derrick Ltd in a dispute on cancelation of special permits for oil extraction. Other areas of expertise cover investment projects support and PPP. Some significant clients include Boston Industrial Corporation, Ares Systems Ltd, PJSC Kyivenergy, Arab Energy Alliance. Anna Ogrenchuk, managing partner, is the main contact. During 2016 GOLAW vividly focused on investment projects, involving regulatory, corporate and project finance matters, development and taxation; EPC contract advisory and construction issues. The firm advised Enkom a.s. on the development of the optimal corporate structure for the implementation of the project on the construction of a heat and power plant with the reconstruction of an administrative and manufacturing complex in Kharkiv. Another continuous highlight is support to the Irish agribusiness Donegal FRS, in the process of attracting new investments into the project to operate a bio power plant. Sergiy Oberkovych, senior partner, is the main contact. Aleksey Pukha and Partners shows active involvement in the sector of alternative energy, energy efficiency, equipment supply, comprehensive investment projects support. The firm also offers expertise on natural resources development and processing, environmental law. Its team advised C.R.E.A.M. Europe PPP Alliance (Belgium) on PPP in the energy field; advises China Insurance on projects to construct social housing using renewable energy sources. Clients include the Gas Institute of Ukraine, Khmelnitsky Dump, Wilo Ukraine, Gas Technology Institute of Ukraine, Mykolaiv Plant of Metal Structures and others. Aleksey Pukha leads the practice. Sokolovskyi & Partners reports on the robust development of its energy practice in the past year. In particular, the firm is active in construction projects of solar and wind power plants, energy-producing facilities, energy saving, electricity networks. The practice benefits from the strong tax practice. The main expert is Oleh Kostiuchenko, overseen by managing partner Vladyslav Sokolovskyi.